Premier Gymnastics & Cheer Academy in Morganville, NJ offers various gymnastics lessons for boys and girls to help strengthen muscles and improve flexibility. From teaching somersaults to advanced tumbling, our instructors will assist you every step of the way. We also offer trampoline classes. Designed for children under 3 years of age, this program utilizes special gymnastics equipment and visual aids for youngsters. Based on the day’s activity plan, the instructors will set up an obstacle course that helps enhance locomotion, hand-eye coordination, and listening and social skills. Other important lessons they can learn include taking turns and following directions. Participating parents learn to become facilitators of the child’s sensory and motor skills development. This class requires one adult participant per enrolled child. 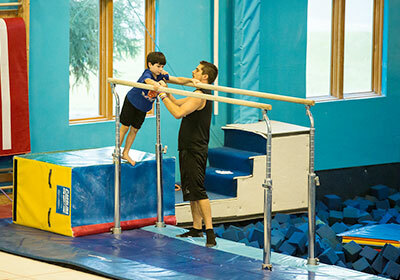 A gymnastics class designed for children 3 to 4 years old, the Tumble Tots program works similarly to Parent Tots classes. However, it introduces students to more gymnastics skills and apparatuses, and there are never more than 7 children allowed in each class. This way, children will get lots of personal attention and equal chances to use the gymnastics equipment. This class is open to boys and girls at least 4 years old who have taken at least 1 session of Tumble Tots. In this skill-oriented program, we put an emphasis on preschool gymnastics to help students perfect their basic gymnastics skills. This will help prepare them for our beginner class. core instruction with fun enthusiasm. This program focuses on tumbling moves from somersault basics to back handsprings and other advanced skills! Beginners and advanced students will learn in a progressive and challenging way to learn the skills correctly and safely. Each tumbling class is designed to teach proper body positioning and alignment through progressive drills and strength conditioning to ensure proper skill development to progress through each level. Our gymnastics teams participate in the USA Gymnastics Program. Our competitive team program requires a year-round commitment to training and competition from both gymnasts and parents. Girls ages 4 to 7 and boys ages 5 to 7 who show a strong desire and physical potential to be competitive gymnasts are placed into our Pre-Team program. These students are evaluated and selected by team coaches, and entry to these classes is by invitation only. Our girls’ team competes in levels 2 to 10 while our boys’ team competes in levels 4 to 10. Our JOGA team participates in JOGA competitions and requires a year-round commitment to training and competition from both gymnasts and parents. We have a JOGA pre-team as well for those gymnasts who still need to perfect their skills before they move to the competitive team. Our competitive JOGA program competes in levels 1 to 6. Enroll your child in our program today and let our gymnastics instructors give them the tools they need to excel in sports. We also offer cheerleading classes for boys and girls. Call our staff to inquire about our application process and the class schedules available.